Recent research from AXELOS showed that recruiting and retaining talent remains the number one HR challenge for UK employers in 2018. Of the 500 HR Managers surveyed, 51% said they struggle to find people with the right skills. The research also highlighted the eye-watering cost of hiring the wrong candidate – an average of around £17,000 for someone on a £50,000 salary. getting it wrong is costly. Having scoped out your role and promoted it beautifully, you now need to wade through all the applications and decide who to interview. How flexible you choose to be at this stage is up to you – and, of course, will depend on how many people have applied. As a first step, check the ‘essentials’ you require, such as minimum qualifications or levels of experience in a similar role, against each candidate’s details. Any that don’t meet your basic requirements can be immediately discounted. Reading between the lines on CVs and application forms can often provide valuable insights. If your role requires excellent attention to detail and the CV or application is littered with spelling and grammatical errors, it’s a pretty good sign they’re not the right candidate on this occasion! If you’re looking for a salesperson with a track record for results, what previous achievements have they highlighted when applying for your role? Of course, sifting through CVs and job applications is not everyone’s idea of a great time. This is one of the key reasons many employers choose to outsource to a specialist recruitment consultant; you benefit from access to a much wider talent pool and have experts create a shortlist for you. 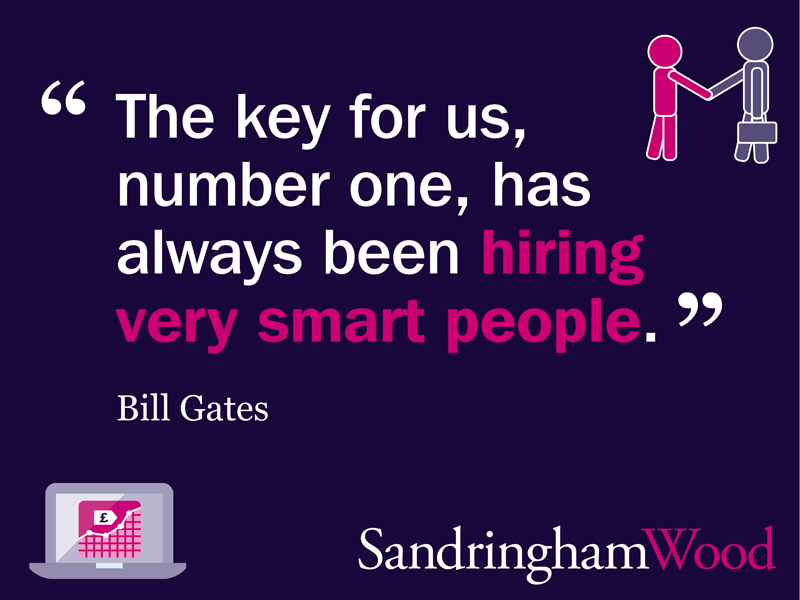 Where you are working with a recruitment consultant, the more collaborative you can be, the better. Have a quick discussion with them about each candidate on the shortlist prior to starting interviews. A good recruiter should have stringently screened any candidates they put forward – this includes holding an initial discussion with them on your behalf to start ‘selling’ your role and business. Listen to their input – you have appointed them for a reason and they should be an expert in this field (if they’re not, it might be time to look for a new recruitment partner!). Once you have decided upon your shortlist you’re ready to arrange interviews. Whilst there is no legal requirement to inform unsuccessful candidates that you have not selected them for interview, it is best practice to send each a brief letter or email to let them know and thank them for their application. This shows that you appreciate the time they have taken to apply and puts your organisation in a good light. This can be useful in terms of maintaining your employer brand in general terms – and you may find that, whilst not suitable for that particular vacancy, they are ideal for a future position that may become available. No doubt, you expect any candidates you’re seeing to have properly prepared for the interview. Make sure you do the same! Book rooms in advance, make sure your receptionists know to expect the candidates and allow enough time for each interview. As much as the candidate is there to impress you, it is your job to show your business in the best possible light. You want your chosen candidate to be enthusiastic about joining you. Think about the questions you will ask in advance of the interview – your aim is to obtain quality information from the candidate in order to gauge their suitability for the role. You may find our employer briefing note on example interview questions useful. Welcome the candidate and try to put them at ease. You want them to feel as relaxed as possible in order for you to see the ‘true’ person. Introduce yourself and any other people present, explaining each of your roles in relation to the interview and the role in question. Explain the structure of the interview. Outline your company background, the role being interviewed for, and where the job fits in terms of the broader business. Ask open-ended questions – ones that cannot be answered with a yes or no and make sure you allow the candidate time to think and speak. Keep control of the interview. If you think the candidate is going off track, turn the conversation back to the information you need. At the end of the interview, ask the candidate if they have any questions. This part of the interview can prove extremely useful in gauging the candidate’s understanding of the vacancy and their genuine level of interest in the role. Inform them of the next stage in the process, e.g. appointment, second interviews or tests and the estimated timescales involved. For specialist roles, additional methods of assessment may be appropriate. These could take the form of practical tests, role plays or psychometric testing. You can also have a quick look online at any public profiles or social media accounts the candidates have; this can be a great way to get a broader sense of the candidate’s personality, approach and drivers. Keep accurate records of all the information obtained through each source – remembering to only record factual information, rather than your own personal opinion of the candidate. Once all stages are completed you should have gathered enough information to make your selection. Next time, I’ll be looking at the all-important job offer – as well as dealing with counter offers and other last-minute changes of heart. You can read more about the AXELOS research quoted in this article here. Very efficient and friendly service. Took account of my situation and acted accordingly. Prompt replies to emails and queries. Recommend for sure!